Michigan athletic director Dave Brandon to announce his resignation on Friday afternoon. Dave Brandon is an ex-University of Michigan athletic director, or at least will be shortly. The Detroit Free Press and Detroit television station WXYZ are among the media outlets that have reported the embattled AD will that he will resign at the end of the year during a press conference on Friday afternoon. Brandon has come under intense criticism this season because of his handling of the Michigan football program. The most notable issue of contention has been the handling of a concussion suffered by Wolverine quarterback Shane Morris during a home loss to Minnesota on Sept. 27. Members of the University of Michigan student body have expressed displeasure with Brandon over rising prices of student section tickets. Michigan alumni have also chimed in about the state of the Wolverine football program, which has of record of 3-5, and is coming off of a humiliating loss to Michigan State last weekend. It seems that we have a winner in the 2014 Internet Halloween contest, and it's not even close. It's a kid dressed up as Twitter legend @FauxPelini. There's your future Nebraska head coach, folks. 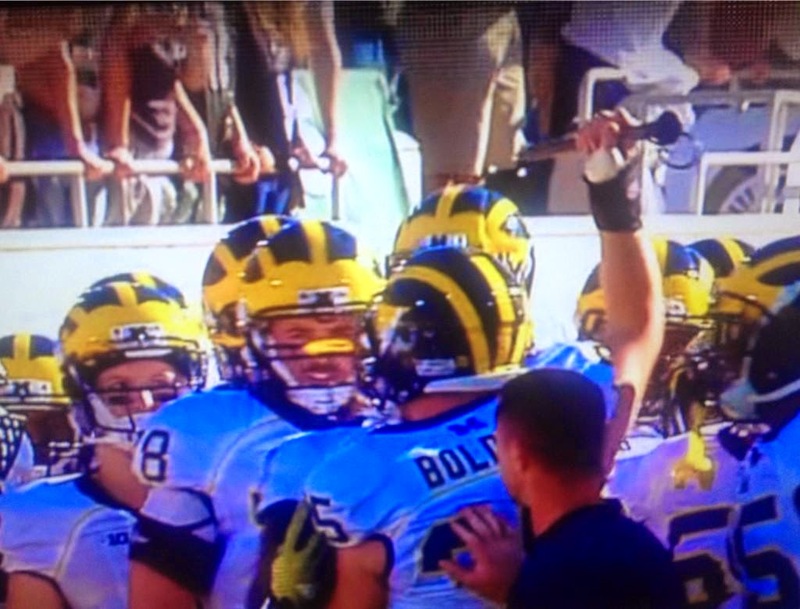 Could Indiana-Michigan be Brady Hoke's Waterloo Sunset? There's not much for Indiana fans to celebrate football-wise this season (other than the tipofff of the college basketball season, of course). The Hoosiers are 3-4 this season, with zero wins in Big Ten conference play. That could change this weekend, the Hoosiers goes on the road to face 3-5 Michigan. NCAA declares that Todd Gurley must sit out two more games. I haven't been more disgusted with college football and the NCAA as I am right now. "Georgia running back Todd Gurley must sit out two more games for accepting more than $3,000 in cash from multiple individuals for autographed memorabilia, the NCAA ruled Wednesday." Georgia is appealing the decision, but its doubtful Todd Gurley will be playing this weekend in th Georgia-Florida game. Meanwhile, the NCAA has generally ignored the ongoing shenanigans of FSU quarterback and sexual deviant Jameis Winston, which includes stealing and shouting sexually-related obscenities in a public place. Disgusting. Rod Smith is an ex-Ohio State running back, dismissed from team. Rod Smith is an ex-Buckeye. The Columbus Dispatch is reporting that the now-former Ohio State running back has been dismissed from the team after allegedly failing a drug test. This has yet to be formally announced by the school. Snith had 24 carries for 101 yards during the 2014 season, with four touchdowns. 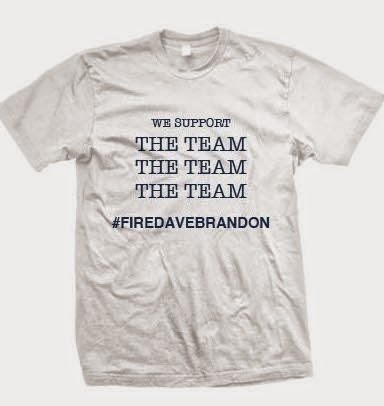 Yes, there are t-shirts calling for Michigan AD Dave Brandon to be fired. An anonymous "Michigan donor" has underwritten the printing of 2,000 t-shirts calling for the firing of Michigan athletic director Dave Brandon. They will be distributed to University of Michigan students to wear at this Saturday's home game against Indiana. The goal is for the t-shirts to be seen during the Big Ten Network's broadcast of the game on Saturday. While it's not the exposure that a game on ESPN or ABC would get, it's probably enough to be somewhat embarrassing to the University of Michigan school administration. The t-shirts feature the phrase "We Support THE TEAM THE TEAM THE TEAM," which is taken from a famous speech to Wolverine players in 2983 by legendary head coach Bo Schembechler. It also includes, naturally the hashtag "Fire Dave Brandon." The T-shirts aren't up for sale, apparently. Though don't be shocked if one or two pops up on eBay in the coming weeks. Billy Donovan has Will Muschamp's back at Florida. Florida head coach Will Muschamp got a show of support on Friday from the Gators men's basketball Billy Donovan. The Gators men's basketball coach gave his support to Muschamp while talking to ESPN's Andy Katz and Seth Greenberg. "Certainly coming toward the end before [Urban Meyer] left, I think Will walked into a very challenging situation. I think everybody knew that," said Donovan, who appeared Friday on the ESPNU College Basketball podcast with Andy Katz and Seth Greenberg. "I think he built in a style of play his first year, and I think he saw a huge jump in his second year. Last year what happened, and I give Will a lot of credit, I don't think enough people have talked about this, people look at their record a year ago and how difficult and challenging it was. As a head coach, he never, ever made one excuse for his players or for himself with the amount of injuries they had. It was totally impossible to overcome the level and the talent of the players that he had. "And I will tell you this: I am a huge Will Muschamp fan. I really respect him as a man. I respect the way he goes to work every day, and the way he's tried to deal and address his team. Certainly in these situations, they are always challenging. But as a man, he is a great guy and I think he's an outstanding football coach. I don't know enough about the X's and O's in football to probably pass an opinion on that. But I do know Will Muschamp is a man, and there's nobody rooting harder for him than I am because he's all about the right things." Florida has a bye in Week 9, and faces its biggest SEC East rival, Georgia, in Jacksonville next weekend. 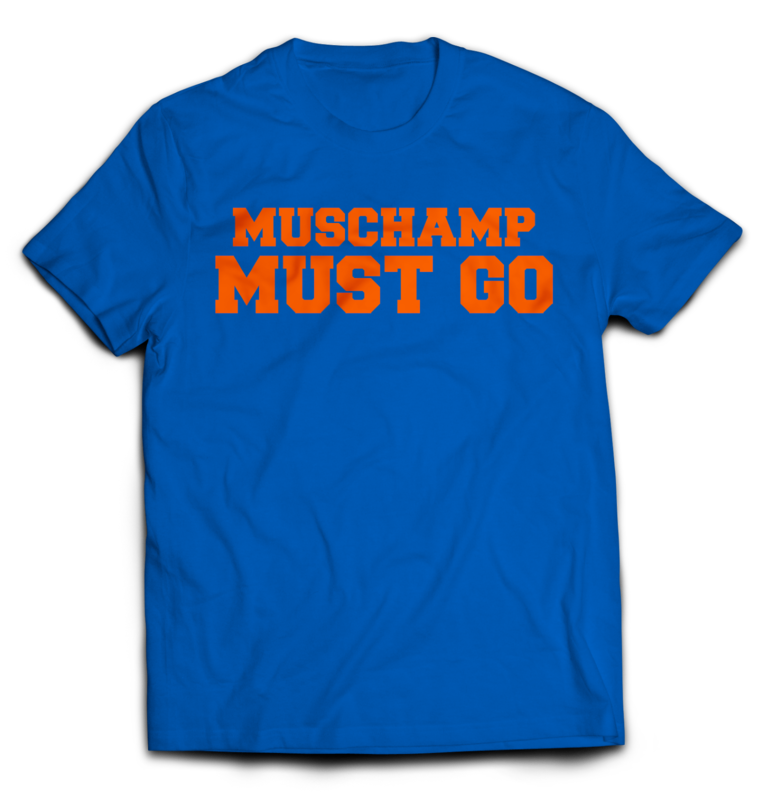 Florida-inspired T-Shirt declares "Muschamp Must Go"
Shirts Are Cool, the company that brought the Florida Gators-themed "This Team Make Me Drink" t-shirt is cashing in on Gator fan frustration once again. This time it's with the more direct declaration that "Muschamp Must Go." It can be yours for $20.00, or $22.00 for the XXL version. 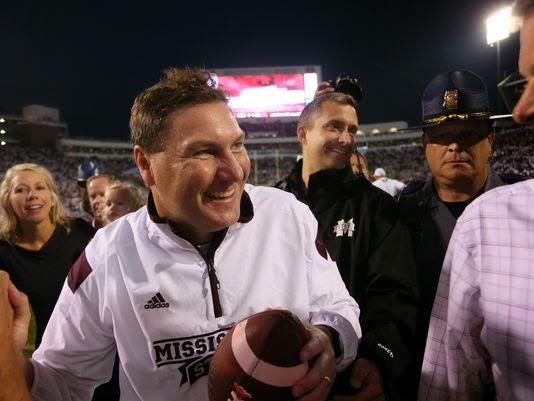 Play the Game Tonight: Dan Mullen, Hugh Freeze, North Carolina, and more. Play the Game Tonight - Week 9 Thursday edition. The only ranked team on the schedule for Thursday night is East Carolina, which hosts UConn at home at 7:00 PM EST (ESPN U). For those looking for a game that involved more traditional powerhouse schools, Miami plays Virginia Tech at 8:00 PM EST (ESPN). A New Hampshire Yankee in King Starkville's court. Bad omen for Mississippi St. of the week. Long way to the top? Big Tentacles: Brady Hoke, Bo Pelini, Nick Hill, and more. Les Miles has a potty mouth, cusses in post-game press conference. LSU head coach Les Miles dropped some not mama-approved language during his post-game press conference on Saturday. The Mad Hatter was asked by a reporter at the conference if "Do you and (LSU offensive coordinator Cam Cameron)put any thought at all in to next year at (quarterback)? Miles might have to sit down with the president of LSU over that one. Steve Spurrier expresses relief that South Carolina doesn't have Mississippi State or Ole Miss on its schedule this season. Steve Spurrier. Photo via GamecockCentral.com. 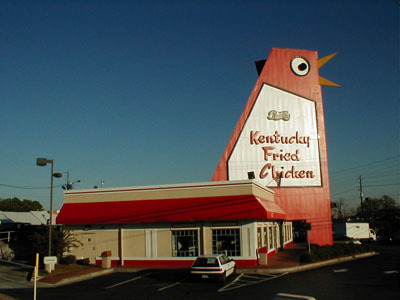 South Carolina is getting ready to face Auburn this coming Saturday. 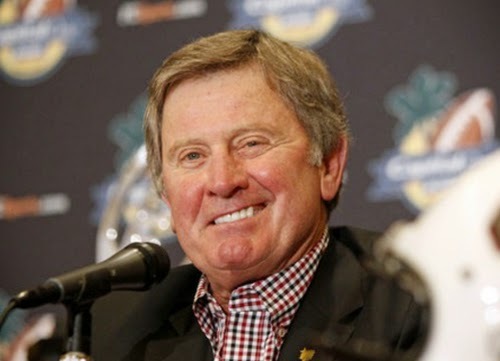 It's a team the Gamecocks have never beaten while Steve Spurrier has been the team's head coach. While Spurrier admits Auburn will be a formable challenge for his team, the Old Ball Coach seems happy to have missed playing the unbeaten two-headed monster of Ole Miss and Mississippi State this season. Play the Game Tonight: Jameis Winston, Todd Gurley, Matt Jones, and more. Play the Game Tonight: Week 8 Saturday edition. Sadly, today is being dominated by the same stories that have put a stranglehold on college football this week: the alleged involvement of Florida State starting quarterback Jameis Winston and Georgia tailback Todd Gurley with memorabilia dealers. Bo, you don't know Diddley! ESPN College GameDay names Ken Griffey Jr and Brett Favre as celebrity pickers for Notre Dame-FSU game. What could possibly be the most awkward edition of ESPN College GameDay possibly just got more awkward. It was bad enough that GameDay is broadcasting from Florida State, where controversies surrounding starting quarterback Jameis Winston have been swirling around the football program like a Seminole Wind this weekend. Now it's been reported that Ken Griffey Jr and Brett Favre have been chosen to be the obligatory GameDay's celebrity game pickers this weekend. 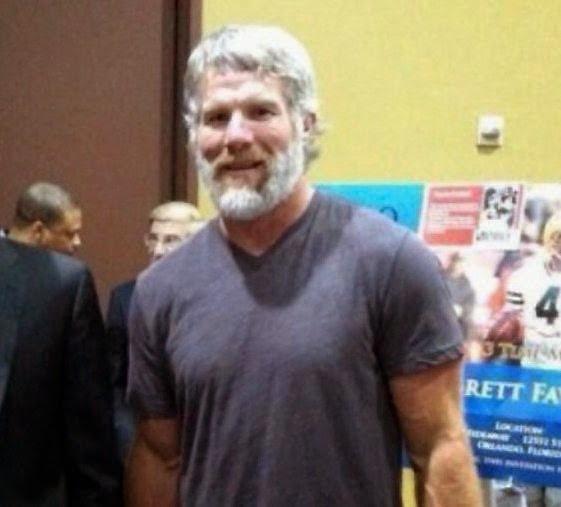 Favre only one obvious connection to FSU - the infamous sexting incident involving former New York Jets "Gameday host" and FSU Cowgirl Jenn Sterger. In light of the allegations of FSU interfering with the police investigation of sexual assault allegations brought against Winston, this could be one of the most tone-deaf moments in ESPN history. Labels: Brett Favre, ESPN College GameDay, Florida State Seminoles, Jenn Sterger, Ken Griffey Jr.
Photo of Ole Miss DE Robert Nkemdiche allegedly using a bong surfaces on internet. From the "things you don't want to show up on the internet after possibly the two best weeks in your school's recent history" department comes a photo of Ole Miss defensive end Robert Nkemdiche allegedly partaking of a bong. Jackson Clarion Ledger beat writer Hugh Kellenberger reported on Twitter that Ole Miss head coach Hugh Freeze was aware of the both the existence and the story behind the Nkemdiche bong photo, including when and where it was taken. Hugh Freeze says he is aware of Robert Nkemdiche photo, including date of and where. "Super confident" drug tests were handled correctly. The polls are out. Mississippi State leapfrogs over Florida State to the top of both polls after the Bulldogs' 38-23 win over Auburn. Burned out today. Will be back tomorrow. (UPDATED):Todd Gurley placed on indefinite suspension by Georgia. Major bad new out of Georgia. The school has suspended tailback Todd Gurley in what's described as "an alleged violation of NCAA rules." Few details are available. UGA released the following statement.
" University of Georgia tailback Todd Gurley has been indefinitely suspended from competition by the UGA Athletic Association during an ongoing investigation into an alleged violation of NCAA rules. "I¹m obviously very disappointed," said UGA head football coach Mark Richt. "The important thing for our team is to turn all our attention toward preparation for Missouri." This pretty much jeopardizes Gurley's chances for Heisman Trophy, and could derail the rest of UGA's season. UPDATED 5:59 PM: Bruce Feldman is reporting that Guley's suspension may involve accepting "extra benefits" from "memorabilia brokers." Hearing the investigation into #UGA star Todd Gurley is for possibly accepting extra benefits for his likeness w memorabilia brokers. 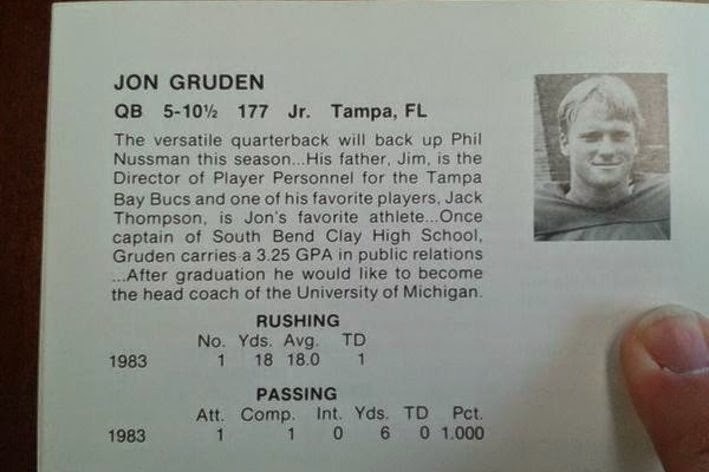 Yes, there's a Jon Gruden to Michigan meme, via 1984 media guide. It only took a couple of weeks or so, but there's finally a solid internet meme involving Jon Gruden as a candidate for Michigan head coach. A University of Dayton public relations major discovered Gruden's bio in a Dayton Flyers football media guide from 1984, where Chucky laid out what he would like to do in the future. Of course, the idea of Gruden as Michigan head coach isn't completely new. There's a Facebook page supporting the idea that dates back to 2010. This discovery of the younger version of Chucky's bio should provide enough fuel until Gruden finds a way to roll this into squeezing more money out of ESPN. 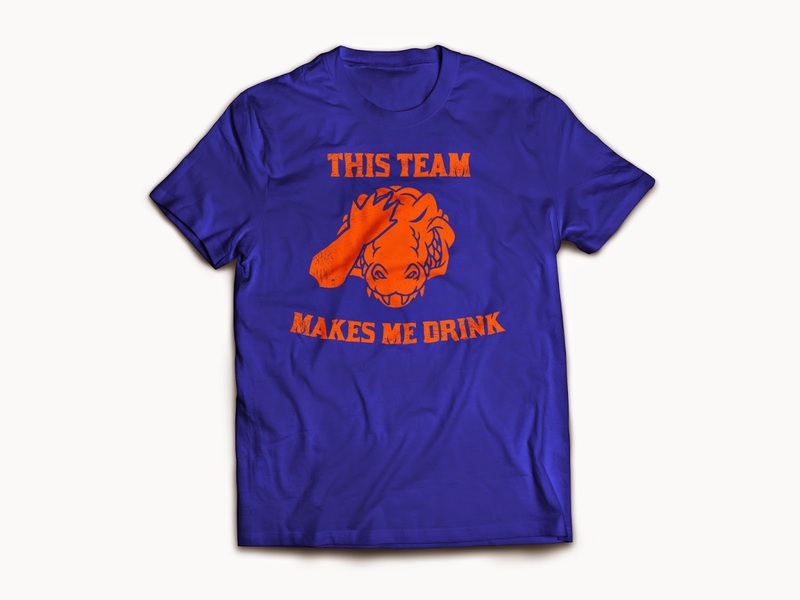 Florida fan gift guide: A drinking shirt with a football problem. Looking for a present for that Florida fan in your life currently drowning in a sea of misery? Shirts Are Cool has this blue and orange t-shirt to help them drown their sorrows in an adult beverage instead. It's yours for $20.00 ($22.00 for XXL). Big Tentacles: Christian Hackenberg, Hayden Fry, J.T. Barrett, and more. Pour Some Sugar on Me? Off Tackle Empire's Mike Jones predicts Michigan State will face Florida State in the Sugar Bowl as part of the inagurial College Football Playoff, with Auburn meeting Baylor on the other side of the CFP bracket in the Rose Bowl. Black Heart Gold Pants looks at how legendary former Iowa head coach Hayden Fry called for a four-team playoff format for college football way back in 1985. Lack of student participation: It's not just for Michigan anymore. Bad officiating? I'm shocked. SHOCKED, I tell you! Florida QB Treon Harris under accused of sexual assault, suspended from Gator football program,. Florida has indefinitely suspended quarterback Treon Harris, who is being investigated by Gainesville, Fl. 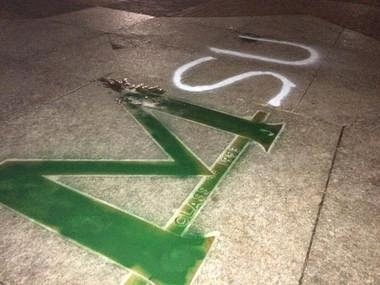 police for accusations that he sexually assaulted a person described as being "a female student." According to ESPN, The University of Florida Police Department is working in conjunction with the Gainesville Police Department to investigate the incident, which alleged to have happened in a University of Florida residence hall early Sunday morning. Harris, who led Florida to a come-from-behind win over Tennessee on Saturday, is suspended indefinitely from all team-related activities. Georgia freshman cornerback arrested for shoplifting, dismissed from team. Shaq Jones is an ex-Georgia freshman cornerback. Jones was dismissed from the Bulldog football program following an arrest on charges of "theft by shoplifting." No details about the arrest have been released. Jones posted a $1,500 bond from Clarke County (Ga.) jail 4:35 PM on Sunday afternoon. He was dismissed from the team two hours later. Jones has played in only one game this season, against Troy. Welcome to the Fallout - Week 6 Sunday edition, with lots of extra fallout. Mississippi State upset Texas A&M. I'm going to assume aTm buries those white and chrome Adidas nightmare unis in the same hazardous waste dump that Georgia buried its black helmets from the 2009 loss to Florida. Florida defeats Tennessee. In any other year, this isn't an upset. This was, however, Tennessee's best chance since 2004 to beat the Gators, and it couldn't. The hot seat talk about Vols head coach Butch Jones should be starting up pretty soon. As for Florida, we may have seen the end of the Jeff Driskel era in Gainesville. His replacement as quarterback, Treon Harris, may give the Gators what it takes for a non-upset victory over Georgia in a few weeks. Ole Miss upset Alabama. Possibly the greatest moment in modern (i.e. post-ESPN) history? 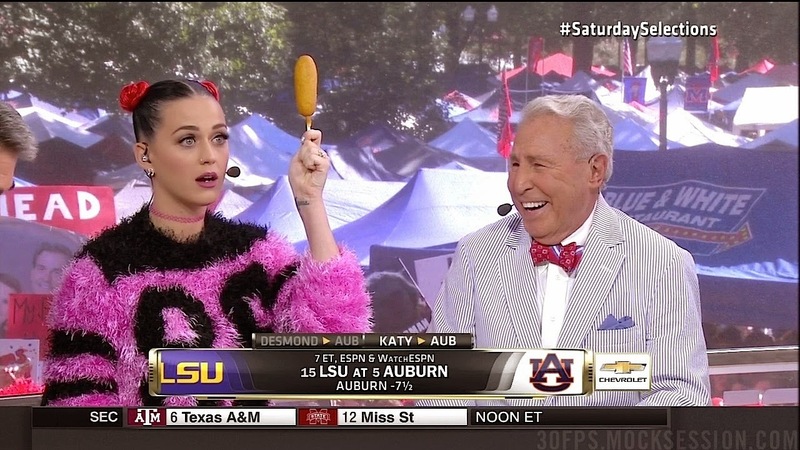 Certainly the greatest night for whatever bar Katy Perry decided to celebrate the Ole Miss victory in on Saturday night. TCU takes down Oklahoma. Barring a hiccup by Baylor, the Sooners are probably on the outside looking in of the CFP. Best-chance scenario for Oklahoma to get back in the CFP running: The Sooners beat Baylor, with an additional Baylor loss somewhere down the line. Rutgers defeats Michigan. By this point, this shouldn't be an upset. The fact Michigan kept it close should have been a positive. As things stand in the wake of the Shane Morris incident, this game has pretty much sealed Brady Hoke's fate at Michigan. As for Rutgers, A win over Michigan is a landmark win, even with a on-the-ropes Michigan. It gives the Scarlet Knights a little proof to back the idea that "Delany's Folly" (i.e the admission of Rutgers and Maryland to the Big Ten) might almost have been worth it. Georgia Tech defeats Miami. That awkward moment when you realize that the Georgia Tech-Georgia game may have actual CFP national title implications for both the Bulldogs and the Yellow Jackets. Michigan State defeats Nebraska. With all the chaos on Saturday, this game should have brought the Spartans back completely into the CFP picture. 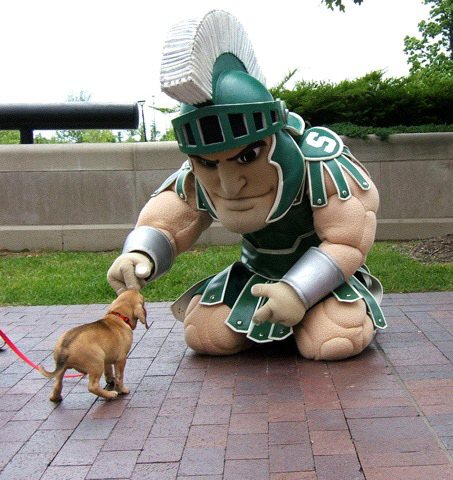 The fact that the Cornhuskers almost came back in the fourth quarter may keep Sparty on the outside looking in. 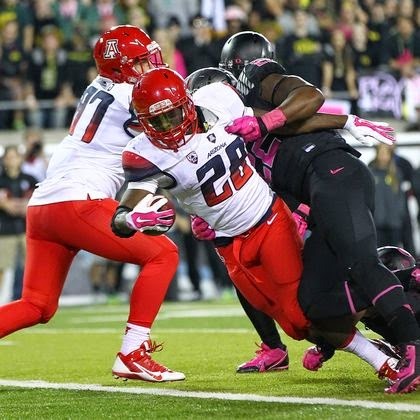 Arizona shook up the College Football Playoff apple cart on Thursday night with a win over Oregon. At the same time it helped mark another red letter day in the ongoing annus horribilis that is Michigan's 2014 college football season. Arizona head coach Rich Rodriguez coached Michigan from 2008-2010. He alienated hordes of Michigan supporters before being fired in January of 2011 by Michigan athletic director Dave Brandon. Brandon replaced RichRod with the now under fire Brady Hoke. Brandon's decision to ditch Rodriguez has started to come back to haunt both him and Michigan. Hoke started out strong in 2011 - with a team mostly of players recruited under Rodriguez. It's been downhill since then. In contrast, Rodriguez started has gone 8-5 seasons in his first two seasons at Arizona, with two bowl wins. On top of that, the Wildcats have now beaten Oregon two seasons in a row. As for Oregon, the team Arizona actually beat Thursday night, they're not completely out of the CFP yet. It will take another loss to knock them out completely. It's looking more and more like Brandon made the wrong decision in not giving RichRod at least another season in Michigan. Hoke, the man Brandon picked to succeed RichRod, has failed to produce after his first season in Ann Arbor. Play the Game Tonight: Ole Miss, Dave Brandon, Nick Marshall, and more. Play the Game Tonight - Week 6 Thursday edition. Three games on tonight. Central Florida at Houston, Florida Atlantic at Florida International, and to cap off the night, Arizona vs. Oregon. Covering Dixie: Lane Kiffin, Derrick Henry, Jeff Driskel, and more.